Need to Contain the Fiber? We Have a Yardage Calculator! Engineered wood fiber is an organic safety surfacing product recommended for use on playground areas. It is spun from the inside of trees, not the bark. It’s compliant with special needs guidelines because it packs down into a smooth surface. All of our engineered wood fiber is certified by the International Playground Equipment Manufacturer’s Association (IPEMA), and it complies with ASTM International safety standards F1292 and F2075. Read here about engineered wood fiber and playground safety considerations. Use our handy calculator to figure out how much fiber you need. Our company has decades of experience with wood fiber. Engineered wood fiber — what is it? Engineered wood fiber is an organic play surfacing. 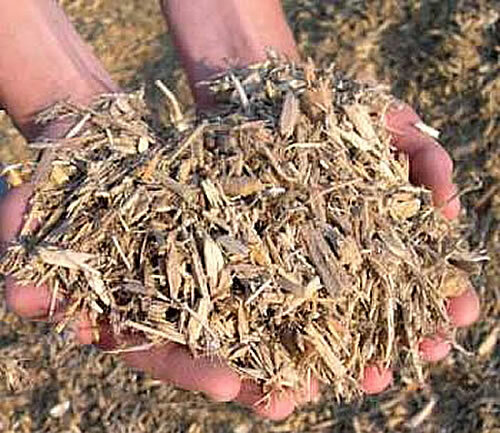 It is ground more finely than wood chips, having a consistency somewhere between woodchips and sawdust. Where do we deliver wood fiber? Our company delivers engineered wood fiber in bulk quantities to your premises, anywhere in the U.S.A. Our extensive supply network reaches all contiguous 48 states. Why use engineered wood fiber? Because wood fiber has high-impact absorbing qualities, yet it’s also economical. And engineered wood fiber packs down into a firm surface, and it’s slip resistant. When engineered wood fiber is properly installed, wheelchairs and strollers can cross over it. For this reason, it’s considered compliant with the Americans with Disabilities Act (ADA) — unlike wood chips, pea gravel, and sand. What type of setting is engineered wood fiber appropriate for? Our wood fiber is perfect for any playground, including schools, daycares, and park and recreation facilities. It can also be used for landscaping purposes. Our parent company, Maryland Materials, is a national installer and supplier of playground surfacing and equipment. A great way to contain the wood fiber is with plastic border timbers, follow the hotlink for more info! Is this engineered wood fiber certified? Yes. Our engineered wood fiber is certified by the International Playground Equipment Manufacturers Association (IPEMA). ASTM International certifies engineered wood fiber for impact attenuation (ASTM F1292), so that it is free of nails, staples and hazardous metals such as lead, mercury and arsenic, and to ensure that it is ground properly so that the product will knit together to meet federal accessibility laws (F2075 test method for engineered wood fiber). Our suppliers use their own test equipment to perform testing on the engineered wood fiber in a variety of temperatures and weather conditions. You can see if your own engineered wood fiber surfacing is certified by going to www.ipema.org. How much engineered wood fiber do I need? If you’re using it on a playground, your play equipment needs a minimum depth of 9 inches of engineered wood fiber underneath it and in the equipment’s use zone (the area six feet around the structure in all directions). Click here for safety information. One popular method of installing engineered wood fiber is to distribute it on top of a layer of landscaping fabic that has been placed over 3-4 inches of gravel. This creates a natural drainage system that flushes out rain water and can extend the life of the engineered wood fiber. For more information about engineered wood fiber (or any other playground questions you may have), just phone us today toll free at (877) 840-0707. You can also complete the Contact Form on this page, or send us an e-mail. Our friendly sales reps are standing by to help with any questions you might have.